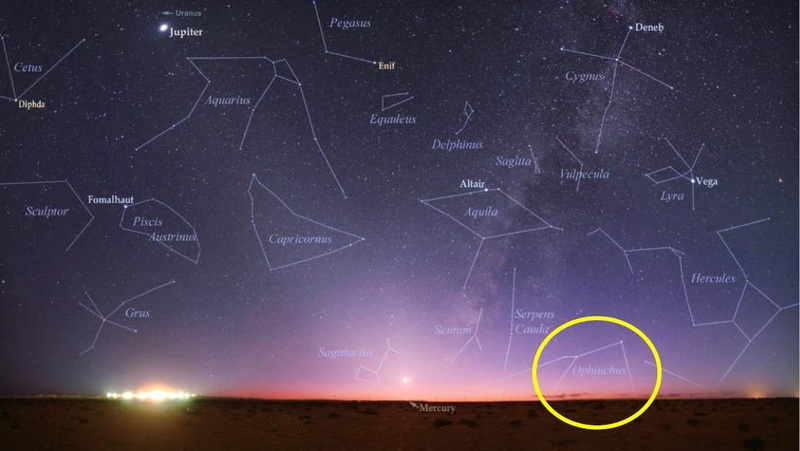 Many people freaked out when they heard that NASA had discovered a 13th zodiac sign (constellation highlighted above). Are you someone that’s captivated by astrology? Do you identify closely with your zodiac sign? If so, you should probably sit down for this. As you may know, over 3,000 years ago the Babylonians created the first zodiac wheel by observing how constellations transition across the sky throughout the year. They identified 12 constellations and created an evenly-spaced calendar based on their positioning in the sky. Each constellation was given its own zodiac sign. But there’s more to the story… Unbeknownst to us until now, the Babylonians actually left out a sign. Last week, NASA made the shocking announcement that there is actually a 13th Zodiac sign. Its name is “Ophiuchus”, and it takes the form of a man entwined with a snake. In the interest of symmetry, the Babylonians decided to omit Ophiuchus. For some, this revelation may result in a small identity crisis. A zodiac sign can hold immense significance; it is part of who you are. It’s crazy to think that all this time, we’ve been reading horoscopes that are almost entirely inaccurate. Oh, and that tattoo on your ankle? It’s suddenly not looking like such a great idea. However, perhaps we need not read so deeply into this. If you’ve lived your whole life as a Sagittarius, for example, there’s nothing to stop you from continuing to do so. If you see the world through Sagittarius-colored glasses, and you like the way it looks, then what’s the harm in simply ignoring the new discovery? Another inevitable consequence of this 13th sign will be increased criticism of astrology. For those who believe zodiac signs and horoscopes are a bunch of nonsense, this will only add more fuel to the fire. Many righteous-sounding “I told you so” statements will be flung. However, is it possible that the recent development could create more accurate horoscopes? After all, the chart now correctly reflects all the zodiac constellations. It may be worth reading a horoscope or two to see what they say. Essentially, it’s up to you how to react to this news. If you’re very serious about astrology, this revelation may take some getting used to. If you think it’s all baloney, then this will provide some ammunition in your fight to rid the world of horoscopes. Then again, let’s not forget what this is, at its core: a 3,000-year-old system for looking at the stars – back before light pollution robbed them from us. For those of us who live in the city, many of these constellations are mysteries. Perhaps we should all make an effort to get out and see the stars more often, whether or not we think they hold a deeper meaning. There is much evidence that many religions (and their holy books), including Christianity, are astrologically based. The linked video is one of many that details the evidence in an easily understandable format. Basically, who cares, social media freaking out, again who cares, I can understand taking something like this and running with it for the sake of a story, but in a world like we have witnessed the last few months, maybe everyone changing signs might be a blessing. The Babylonian 13 sign zodiac system is just a different perspective on astrology in the same way that Vedic astrology from India (over 5000 years old) is a different system. Most people in western astrology are not the same sign as they are in Vedic astrology, but that doesn’t mean that either system is wrong. Each approaches understanding heavenly influences in a different way. Western astrology is based on ego and personality, whereas Vedic astrology is based on karma and fate. Astrology systems are far, far more complex than just the sun sign, as they consider all the other planets and where they are in the houses, the signs and the aspects (angular relationships of the planets). This is why most people don’t really understand astrology and can easily blow it off, thinking it’s just simpleton hogwash. Well, the limited tabloid magazine version of astrology is indeed simpleton hogwash. Astrology, like religion or philosophy is complex and nuanced. It can be studied for a lifetime and still not fully understood, like life. These systems of knowledge were developed over thousands of years of observation. They may seem foreign or non-scientific, but they do work and they do have value–like acupuncture or like Ayurvedic medicine. Many cultures revered the number 13, especially agrarian cultures that live with the moon cycles, because there are 13 lunar cycles in a year. The Mayans believed the number 13 is very powerful and their whole system of measuring time is based on the number 13. The Mayan system of measuring time is far more complex and far-reaching than our traditional western system. But I believe the number 13 fell out of favor with the spread of Christianity and its quest to rid the population of nature-worshiping or pagan influences. Pagan, Mayan or other non-Christian belief systems have been considered evil by orthodox Christianity. By searching “bible astrology”, we can find many well documented explorations of the connections between Christianity and both the Sun (Son) and the Zodiac. I prefer to watch documentaries that include illustrations and animation to simply reading, but a search will provide both. Here’s an excellent production that makes the connection quite clear and understandable. Brother John, thank you for posting. The video certainly presents very challenging and thought-provoking ideas, many of which I was already familiar with, but also many of which are new to me. I consider the presented material a valuable addition to my search for truth and I hope to view it several times again in the future. I also plan on doing some further research to verify the accuracy of several statements in it, because I tend to take presentations on religious history with a grain of salt. I do know already that much of what was presented here is accurate, as far as what I have found in my previous research into astrological and religious history. It’s all such an incomplete puzzle and I really don’t think anyone can claim to know the whole truth–unless you are already a God-realized soul. Lee, I highly recommend the Zeitgeist series for truth regarding a variety of areas, not only religion. I agree that we’ll never know the whole truth until we’re released from our 3 dimensional human existence, but in the meantime, we can shed any beliefs that no longer appear truthful. There is a Pagan tradition that claims a 13th month. It falls from October 31 to November 2.
the idea of Pluto being demoted to an asteroid or something. But no longer a planet. Lyn, I didn’t know about the short Pagan month. It’s a fascinating concept to me, as a western-system Scorpio and Vedic Sagittarius. I do know the Mayans have a similar short month of 5 “unlucky days” at the end of the year, after their 18 months of 20 days each. Their system relies heavily on the number 13 and measures time clear out to the 26,000 year cycle of the procession of the equinoxes. Who knows how they knew this scientific fact or how they came about this knowledge of time that surpasses the known history of modern civilization. But it’s curious how similar their concepts are to the Pagans. BTW, I do not go along with Pluto being demoted, but astronomical demotion does not negate its astrological importance. It has a strong historical correlation to planetary events on earth, especially cycles of social transformation and war. Oct. 31-Nov.2: Those days are the high holy days of Samhain (sow-in) which later became modern “Halloween” The Celts celebrated the end of the summer and the beginning of winter during those days, and believed it was when the veil between the world of the living and those who had passed on was at its thinnest energetically so this was a very important time for druid priests/priestesses to communicate with those who had crossed for advice, and to honor the ancestors of the clans. My birthday falls on Nov. 4, and I have always considered my birthday very sacred because it comes at the close of Samhain; I grew up as a child always in love with Halloween and all things “witchy”. I am an empath, a medium, a healer, a priestess, and a teacher, and hold very sacred the ancient teachings. Scorpios are a sign that is most in tune with the cycle of birth/death/rebirth and most likely to be psychic mediums (from what I have read), so to me it makes sense that the sign of Scorpio holds the ancient Celtic Pagan Sabbat of Samhain right in the middle of the sign’s month. It is interesting however, to note the idea of a 13th astro sign because of the ancient pagan connection to the number 13, with 13 lunar months occurring in a year, and for most women, 13 menstrual periods in a year. This discussion is intriguing to me, however, regardless of the updated 13 signs, I will forever be a Scorpio, and as a matter of fact, literally just had its symbol tattooed behind my right ear! 😀 Thanks for the engaging discussion! Blessed Be. Interesting that the Mexican Dia de Los Muertos (Day of the Dead) celebration, when people reach out to the spirits of their dearly departed ones, follows so closely the original Samhain holiday. Samhain, Halloween, Dia de Los Muertos occur during one of the four “power points” of the zodiac calendar year. We still commonly recognize two others, those of May Day (May 1) and Groundhog Day Feb 2). May we learn to appreciate Samhain through our love and respectful remembrances of our departed loved ones at this subtly powerful time of the year. Happy Samhain to all. However, if the signs change or shift, so might the attributes assigned to them. The attributes for Pisces may now include your strongest traits along with some of Pisces that may apply to you. Until I realized that may be the case, I was also dismayed and skeptical as I too believed myself to be an Aries all of my life. And though next to each other on the chart, seemed totally at odds with each other. I have enjoyed being an Aries, an Irishman and born in the Year of the Tiger, though my temper knew no bounds. Maybe this will be better for me. Provide some much needed anger management tools! It’s one of the better explanations I’ve found, Lee, although there are many others. Anthropomorphism has led billions of people down a rabbit hole and away from truth for thousands of years. Man’s hubris in action. It seems that one of the sidetracks was changing Sun to Son. You may also find information about the Annunaki and Nephilim compelling. As most deities, certainly including those of Christianity, are extraterrestrial, supernatural entities, it’s rather stunning that the stories about the Nephilim are often left unsaid and unexplored. Visitations by extraterrestrials (the Annunaki) to Mesopotamia and the sharing of knowledge between the two is a logical explanation for the huge advances this ancient civilization brought to mankind as well as the source for much of today’s religious beliefs. The Nephilim and Annunaki information is indeed compelling. I agree with the conclusion of the article that says we’ll probably never know the exact story or get the whole picture of this ancient verbal human history tied together with myth, story-telling, multiple language translations, and interpreted through the lenses of different cultures and religions. As it concludes, our best approach to understanding is to keep an open mind. Thank you for sharing. NASA! Yea, right. The 13th sign (under which I fall) is man or kind-of-man holding, wiggling, or wrestling with his snake. Funny! Looks like Enki getting himself prepared to fashion homo sapien sapien. Brother John – very enlightening information you share, as usual. Was just reading The Book of Enoch in the Old Testament Pseudepigrapha. Also read Sitchin’s chronicles and Bramley’s The Gods of Eden many years ago. Shed much light on what I read in the Holy Bible, KJV relative to the Nephilim. Hold up, wait a minute. The 13th sign could be man embracing/acknowledging his higher self (serpent =kundalini). I’ve always sought truth and enlightenment rather than justifications for my existing beliefs, MC. It seems likely that the study we’ve done provides more pieces of the puzzle, but I doubt that we’ll see the full picture while trapped in our meat suits on our three dimensional plane of existence. Virtually all deities, including Allah, God, Jesus, the angels, Jupiter, Zeus, Mithra et al are extraterrestrial, supernatural entities. Anthropomorphized depictions of extraterrestrial visitors to our planet seems to have blurred this connection with a bewildering plethora of manmade details. Considering mankind’s incredible hubris, it’s not surprising that they tend to depict the human species (particularly those that are “believers” in each particular storyline) and the planet we inhabit as the epitome of creation in all of the Universe. For contrast, search images of God. Virtually all of them resemble a bearded man, often in the clouds, sometimes benevolent, sometimes angry, but always “in our image”. Compare it to images of extraterrestrials or aliens. These are certainly not humanlike and our hubris infected minds reel deny that such entities exist, particularly if they are more advanced and intelligent than ourselves. But perhaps this isn’t true as evidenced by the article linked below. It is amusing that shouting “Praise Jesus” in a church results in waving arms and Bibles, while the same support for belief in any other ET’s is usually met with mocking and the crafting of tin foil hats. there is something to it ive been able to guess people for 40 yrs i must be pschic i even saw jesus as a kid glowing gold and white but couldnt see his face i could have known the answers to the world but couldnt understand him i was sitting on my bed when i yelled mom she ran in he disappered my mother was religious and i always feel his presance so its all true! Okay so if im born January 21st 1980 do I not have a sign or am I overlooking it because I’m an aquarius my whole life and it me fits me perfectly. All 12 zodiac signs are symbolized by an animal, human, or symbol, not a combination of them. Just because a new constellation has been “discovered” does not mean that it automatically becomes part of the zodiac. Other constellations such as the Big and Little Dippers, Cassiopeia, and Ursa Major are not signs of the zodiac. Designating Ophiuchus as a zodiac sign is clearly an error on some overenthusiastic astronomer’s part. I am the epitome of a Scorpio, and the idea of me becoming a Libra would make my astrologer and friends laugh their asses off. Seems to me like the idea of a 13th zodiac sign is a hoax. It should be noted that this isn’t the first uncovering of a 13th sign. Arachne has long been purported to be that sign, symbolized by the spider and associated with a period of time that fall between Taurus and Gemini. Isn’t Sagittarius a ***CENTAURIAN*** archer? Equine body, human torso/head? Arachne sign was used in the past, at the center, I think. If you look at the magnetic field of the Earth in space you’ll see the similarity in shape. Being Pisces and Aquarius now, no problem. Has any one considered that the Babylonians felt that this thirteenth sign did not work and therefore was not a sign and discarded for good reason? What did they know and understand that we are missing today? It could be that the indications of someone born during this time did not match the 13th sign and possibly the shift it caused also may have caused a miss-match in the other 12 signs. The scholars of their time seemed to generally understand the way of nature and the world far better than our contemporaries, as alluded to earlier in this discussion. In the Chinese astrology, the number 13 is represented as a 4, (1 + 3 = 4), which reflects death as well as transformation and the next world. The other signs are about life and this world. From that perspective this 13th sign might not be a fit. What are the indications of this 13th sign? Great comment, Jessica! It coincides with the idea that this is associated with Samhain and All Souls’ Day. Very astute. There is a clue there for us to understand this 13th sign and its disappearance. Thank you, Rev Marianne. I have never really understood Western astrology and beyond the month I was born, my chart has never made sense to me nor anyone who knows me, thus I am not a good contributor to this dialog, beyond asking questions. Chinese astrology makes perfect sense to me, although I am not Asian. It really doesn’t make sense that in such a complex study of the stars and life, that the Babylonians would discard an entire sign simply to make it more simple, running the risk of being incorrect. They would be more apt to discard it for political or social reasons, including not wanting to reinforce bringing in certain types of energy into the world. Fear is a strong motivator. The ancient ways of divining and understanding life seem to be more similar to each other than their contemporary forms. Since it was the ancient Babylonians who made the decision to discard this 13th sign, the answers may be found in many of the ancient forms of astrology and divining. From this perspective, death was more a part of life and there are those people brought into the world to help others let go appropriately and grieve. Could there be a brief or regular lengthened sign? Would it be annual? Is there a group of people who truly don’t fit “their sign”, albeit do have similar patterns amongst themselves? What is that pattern and does it hold to be true? For those who have a strong understanding of the Western astrology (possibly other ancient studies) AND an open mind, they may find the truth to this 13th sign. Best of Luck to those who seek this truth. I look forward to learning from you the truth. This isn’t new. I have been telling people i was an Ophiuchi for well over 7 years. This just makes the news once a decade, everyone gets excited about it and then it goes away. They just divided the sky into 12 equal parts to make it simple. But there are 13 constellations on the elliptical and they are all different sizes. Tammy’s posted Snopes (truth-seeking) article gives a pretty good explanation of this whole matter of the 13th sign, and I’ll take it a step further to hopefully shine some light on this whole controversy about the different signs and concern about having to re-write or re-interpret our astrological understanding. The Snopes article describes how our western astrology is based on the seasons: for example, Aries begins on the spring equinox, Libra on the autumnal equinox. It is a scientific fact that the sun is not actually “in” the sign of Aries during the entire month beginning on March 20th. And likewise, the sun is not within any of the astrological zodiac star formations during the entire run of that sign. The reason for this reality is due to the procession of the equinoxes, whereby the tilt of the earth rotates backwards through the signs, and makes an entire rotation every 26,000 years, (something the Mayans somehow understood). Because of this procession, in a few centuries in the future our north pole will no longer point toward the star Polaris. Our astrology system began hundreds of years ago when the direction of the earth’s axis did cause the appearance of the spring equinox to occur at the beginning of the Sun’s journey through the constellation Aries. But the sun no longer does move into the constellation Aries beginning on March 20th. In other words, the actual the constellations have slowly shifted through the seasons. There are 2 ways to deal with this scientific fact: 1) the eastern system (Vedic) of astrology continues to consider planetary movements in relation to the exact star constellation (12 constellations only, similar to the western system). 2) the western system (ours) decided to forget about the exact location of each constellation but to consider instead the sky divided into 12 equal sections based upon the equinoxes and solstices. Our system of 12 “signs” are not aligned with the actual 12 constellations. But here’s the funny thing: BOTH systems work in their own way. We are familiar with the “personality-based” western astrology system and it works perfectly well based on the seasons of our sun. Coincidentally, our “sun sign” traditionally relates to our personality, our ego, our individuality and who we think we are. However, the eastern system deals with deeper issues dealing with our fate and our karma. It is more of a spiritual look into who we are as a soul, not so much who we are as an ego, as a personality. It deals with not just this life, but previous incarnations. If you chose not to believe in that, the eastern system will not have much meaning for you. In summary, just because there may be different systems to look at celestial influences upon the earth does not mean that the system or the approach we have is not valid. And whether or not the sun crosses 12, 13 or even 18 constellations, it does not matter one bit to our western astrological system aligning with the seasons only, NOT the constellations themselves. Maybe Prince was onto something since the symbol for Ophicuchus looks like his “name” when he choose to use a symbol for his moniker. What does it matter? 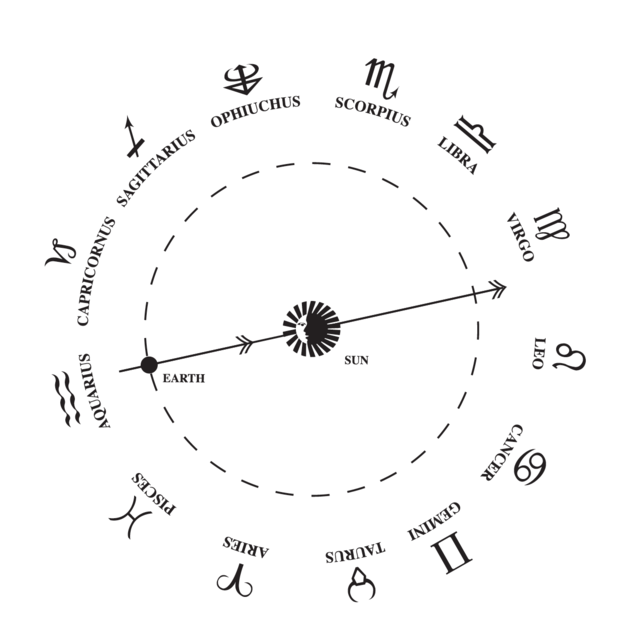 If the Bible and other religious books are based on the zodiac signs and the sun then they are all connected in a harmonious way. If the zodiac was incomplete then the religious texts are incomplete as well. That includes the Christian Bible. It states that anyone attempting to rewrite it would deserve to go to Hell, or something similar, but it looks like it is inaccurate. History shows how the Bible is flawed, to some extent, and so does this information. I don’t believe everything in the world’s religious books is propper or holy. Stoning women is just evil and immoral. Killing of non converts to Islam is a prime example of evil and unholy behavior. All religions are flawed. I don’t know how much I can take seriously concerning religion. The attempt at making this world a better place to live in, the charitable acts of kindness and service to others, and teaching moral lessons to rid our world of sin seem fine. I don’t object to everything about faith and love of the religious followers of God, in any of his names, but there must be a reality beyond male hiarchy in this world and the next. Duality of deities, male and female, must be closer to the truth than previously considered. No religious symbol, that I can see, fits this better than the Yin Yang symbol. Male and female duality is expressed properly in it. Being that there are females represented in Buddhist beliefs, as well as many other pagan religious beliefs, I believe that the return of a female deity, equal to the sun male deity Jesus Christ and all sun male deities, should return to all faiths. After all, wasn’t the Moon Goddess the first deity ever worshiped in recorded faith. There are small statues of her that still exist to this day. Women and men, both, take a part in creating a child in the world. Women are the magic makers, by all accounts, producing the offspring from their wombs. Wicca shows duality. I don’t know that I have the faith in Wicca that it would take to be an occult member of a coven, because of the highly unlikely possibility of it concerning it’s true origins, but I believe that they hold a unique belief in the female deity that is genuine to a good degree. I would like to see all religions to embrace a duality in female and male deities. This is needed. to the Sag sign anyway.